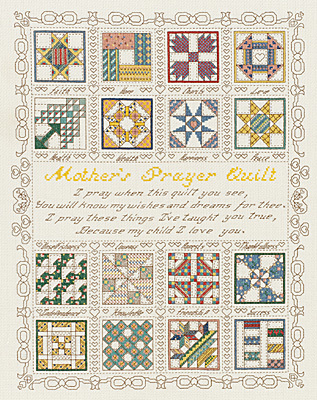 Karen Kluba designed the Mother’s Prayer counted cross stitch kit for Janlynn. The piece displays a mother’s heartfelt wishes for her child amongst traditional quilt designs and an intricate border pattern. The finished design measures 15” x 18” and the soft floss hues of the piece make it a lovely addition to any room’s décor. Kit contains: 100% cotton 14-count Antiqie White Aida 20"x23", graph & multi-lingual instructions. Stitch Count: 188w x 238h. Made in the USA.